DOMESTIC GODDESSES: Weekend fry up! I am a big fan of a full house breakfast but I am always amazed at how often they are just rubbery grease fests. It doesn't have to be that way. Now I’m the last person to hold back on the butter and cream but there is a threshold where rich and creamy becomes greasy and nauseating. I cooked a brunch last Saturday which for me hit the spot 100%. 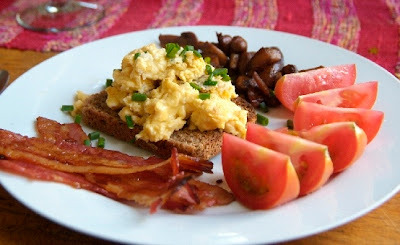 Creamy scrambled eggs with fresh chives on whole wheat bread, crispy grilled bacon, sautéed mushrooms and fresh tomato. It was the perfect balance of salty fry up with a fresh wholesome edge which left me feeling good rather than guilty. Despite seeming like the easy way to make eggs, scrambled eggs can be quite tricky to get right. The method I use is easy but you need to get the timing right. Only start the eggs once all the other elements of your meal are almost good to go. You need 2 Tbsp (30ml) of water, milk or cream per egg. Keep the seasoning simple - salt, pepper and fresh chives or spring onions if you have. Whisk the eggs with a fork. Heat a non stick pan on medium heat, add some butter or olive oil and once melted add the scrambled eggs and don’t stir or move the mixture at all until it has cooked halfway through. Then remove the pan from the heat, scramble the eggs and allow the retained heat from the eggs and the pan to do the rest of the cooking. Serve immediately. The eggs will not be ‘snotty’ - there is enough heat to finish the cooking process completely while still keeping your eggs soft and moist. I have written about the perfect way to sauté mushrooms many times before so you can just click through to this link. Perfectly grilled bacon is another passion of mine and also something which I have burned more time than I care to admit. The timing between perfectly crispy bacon and burned bacon is a minute or two, so one needs to keep ones eye on it. I pre-heat my oven to 220C˚, I lay my rashers of streaky bacon (I prefer streaky bacon to back bacon) on an oven tray and place them in the fully pre-heated oven for about 10 – 15 minutes. Set your timer to 10 minutes and then keep an eye on them. You want the bacon fat to turn a caramel colour, then remove it from the oven and serve. 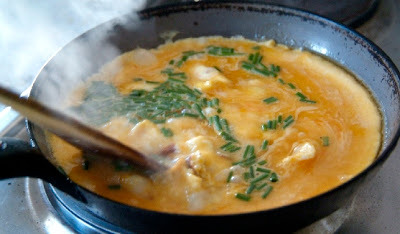 I like to use the drippings from the pan to fry my scrambled eggs with but that is totally optional. you really are quite the queen of sizzeling!